Photography & Interview Luke Ray. This article first appeared in Fuel Magazine issue 24. I’m Tony Eisner, I work in sales at Antique Tyres. Tell me about your first love for cars.. right back when you were young. What inspired you? 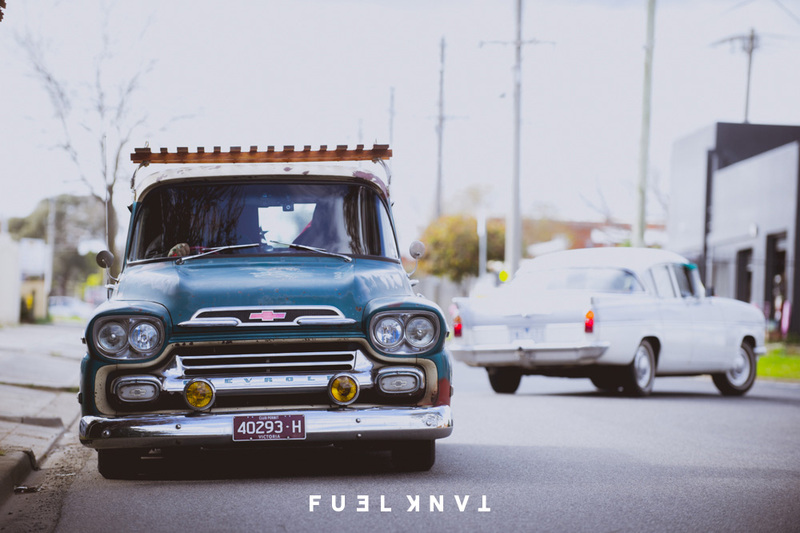 When I was fifteen, the owner of the local servo had a 1956 Chevy with a big block. He locked up the servo at 9pm every night. When he left he’d give it heaps and I’d always be there to see it. A 1955 Chevrolet four door with a 327 V8. It had chrome wheels, a black tuck and roll interior. It was metallic blue. I was aged seventeen and nine months and I felt like king of the neighbourhood. How many cars have you had? Bikes and anything old! I’m a mad collector. I had a 1956 Chevy pickup years ago which I had to sell when we had our first child. I’ve needed to scratch that itch ever since. Pretty much the same condition as you see it now. Can you run through what you did during the build? At first I just wanted it on airbags, sitting on the sills, so a 10” notched four bar rear end was first, followed by a Jag front end and I changed the dash from left hand drive to right. Then came a Holden 2nd gen six litre with 6 speed auto. I went down the modern and comfortable route from then on with options like smart start, digital dash, electric windows, central locking, reverse camera, heated seats, sat nav, full sound system, fridge, air con, power steering and modern fog lights. The interior style is diamond and tuck and roll using crushed red velvet and burgundy vinyl. Wheels and tyres are of course from Antique Tyres; Coker 225/75/15 on the rear and Coker 215/75/15 on the front, 15x7 chrome rims and spider caps on the back and 15x6 up front. People just love the truck. They smile and either wave or give me the thumbs up all the time. The scene at the moment is mad about pickups in general. Working on my two door 1950 Ford Club Coupe.